I started running “barefoot” last October after reading the book “Born To Run” by journalist and ultra-marathon runner Christopher McDougall. The book is a great read and I was a fan after reading it but THEN I sent Chris some questions and he actually wrote me back, so now I’m a fan for life! As I was saying… in the book he talks about, among many interesting things, a study that showed the correlation between the price of your running shoes and injuries is this— the more expensive the shoe the higher rate of injury. This concerned me because I have been running in high-end shoes for years now. My shoes have a price tag of $174.00. I have survived… but my last few races I did say, “Hello” to my left knee and noticed my achilles was acting up. I wondered if my racing days were coming to a quick close. I figured it wouldn’t hurt to leave the pricey shoes in my closet and pick up a pair of $80 Vibram FiveFingers. I was thrilled to see Suzie Cooney’s Athleta Chi article, “Born Free: Barefoot Running” because Suzie did a great job of explaining the mechanics behind running barefoot and she shared credible references. I am more of the grab a pair, put them on and go kind of girl. I did just that. 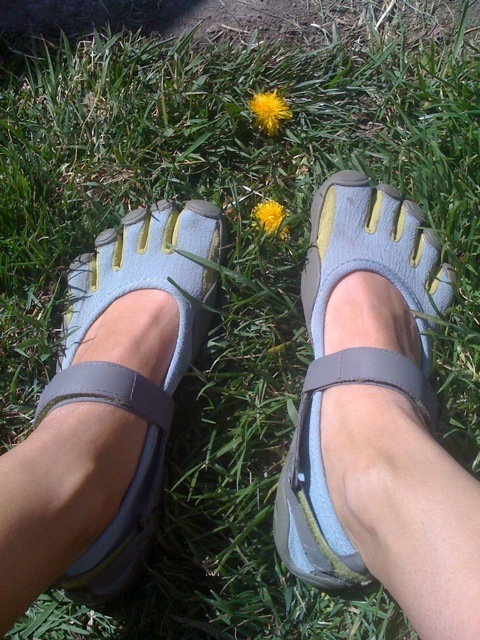 I put on my Vibram FiveFingers in October. I knew I wasn’t supposed to just take off running vast mileage so I wore the shoes around town and to the gym, at the airport and the grocery store. In December I was corralled waiting for the start of the Las Vegas Rock & Roll Half-Marathon and I noticed a man wearing FiveFingers! I wanted to ask him about them and how he got up to training for his half marathon in them, but I didn’t say anything to him. (Silly me) I was running in my high-end shoes because I knew that I hadn’t built up enough “barefoot” miles. In April I ran the 2010 Salt Lake City Half-Marathon “barefoot.” I was running the race with my husband, Aaron, my thirteen-year-old daughter Leah, while pushing my ten-year-old daughter Lucy in a jog stroller and that combination took most of my attention. It was only around mile 10 that I even remembered that I was running the race “barefoot” and smiled that something that had seemed like such a big deal only four months back had almost gone unnoticed. Here is how I conditioned my feet for the race. Like I said, I wore my Five Fingers around town and to the gym for my workouts. I was doing 20 minutes of cardio three days a week. My feet held up great. When you start wearing them, you will notice changes in your gait. You just can’t comfortably run heel-to-toe in a shoe that was not created to force that movement. Think about a child, they don’t run heel-to-toe. Take off your shoes and sprint on the grass. You probably won’t run heel-to-toe either. Your feet will stretch and feel the ground beneath them. Your toes will spread out and actively participate in your run. 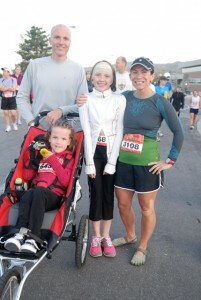 Get comfortable with your new gait and then start adding time and miles. One of the first things I noticed was that my calves hit a new burn level. Living in Utah, I waited until enough snow had melted before I transitioned my training from the treadmill to the streets, my calves were on fire again. I run “barefoot” in the rain, but the snow is just too cold. 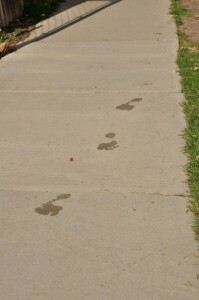 Running in the rain is great especially when you circle back around to look at your cute footprints. Listen to your body and listen to your feet. If your feet are slapping the ground and making a lot of noise, you might be tired. Slow down or walk. I love running in the grass and on trails and I think it’s kinder and easier on your feet. If you think about it concrete and pavement weren’t created with barefoot running in mind… at all. For snowy days I have picked up a pair of Nike Free 5.0. These shoes are Nike’s answer to the minimalist’s shoe. The following is the three-day per week half-marathon training I followed while also conditioning my feet for the “barefoot” run. 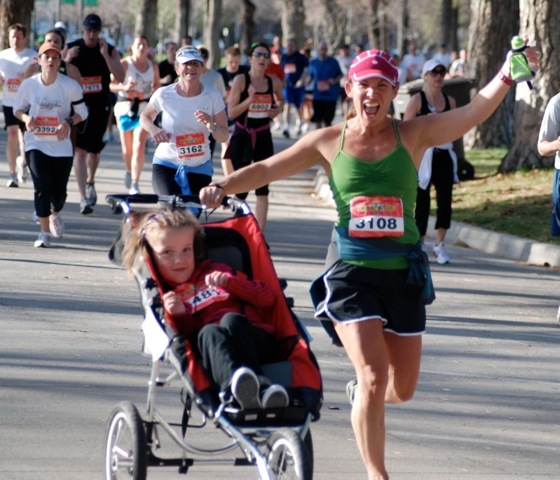 This is a great beginner half-marathon training program modified by our trainer Kasey Payzant. This is the schedule she uses to train children and teens and the rest of us who don’t have the time to get four runs in each week. If you are not yet up to running 3 miles you can add 2-3 weeks to the top of this training. You may want to start with 1 mile, 1 mile, 2 miles the first week. Followed by 1.5 miles, 1.5 miles, 2 miles the next week and continue with 2 miles, 2 miles, 3 miles the following week, then follow the program below. If you are training for your first half-marathon, barefoot or soled, choose your race and get your calendar out. Work backwards from the race day week by week. You do not want to finish your training without a race to run. Similarly, you probably wont finish your training if you haven’t actually registered for your half-marathon. Don’t give yourself an out. Barefoot Running: running with nothing on your feet. “Barefoot” Running: running with minimal foot protection.